How I Gained It: Growing up, my family had a lifestyle like that of millions of other Americans across the country. The kids sit through school and free time is spent studying or in front of the television. When we visited the supermarket, we bought in bulk, or in our case, the largest bag of sugary cereal for the cheapest price. A premium was placed on education, rather than sports or any other sort of physical activity. This resulted in a sedentary lifestyle with my personal health spiraling downwards. By age 12, due to a poor diet and lack of exercise, I weighed 200 pounds, twice as much as my peers. There's a gradual decline for most morbidly obese people: Your friends and family want to help you, but simply do not know how. They can only please you through the only way they know: taking you out to a restaurant for yet another fatty meal. I became more distant and aloof; the fat kid isn't invited to the high school parties. And I ate away my troubles, piling on the pounds. Being 400 pounds is worse than being invisible. People go out of their way to not acknowledge your existence. They act like you are a failure to society and undeserving of a door being held for you, proper service at a restaurant (why should anyone add to the problem?) or other general courtesies. Breaking Point: My path toward a new life involved several triggers to change, but one clear catalyst. Prior to my epiphany, I prepared to have my foot amputated due to Type 2 diabetes, ran a small business which had gone belly up (pun intended). And then it happened. In March 2005, I was called in for a job interview and needed to buy a suit. I went to a discount liquidator, which carried larger men's sizes, since going to a normal store was out of the question. After begging for a staff member's assistance, the salesman begrudgingly came over to me. He took out his tape measure and placed it around my waist: 62 inches. The five-foot tape measure was simply not large enough to fit around my stomach. In shock, he told me that I may need to commission a tailor to create something custom, the implication being that no normal apparel company would mass produce a product for a man of my size. I remember, very clearly, walking out of the store, with my head down, tears running down my face, shame permeating my heart, to look up and find myself staring back in a mirror. I didn't recognize that person. I made a decision that March day to change my life for the better. Whether I had inherited a bad set of cards or simply played the game wrong, I needed to assume these liabilities and create something of value on my own. How I Lost It: Despite my weight, I always thought of myself as a smart person, having started a business when I was 15 years old. I believed if I did enough research online, I could figure out what I needed to do. My family, however, believed gastric bypass surgery was my only solution, but I wanted to prove to myself that I could do it on my own and attacked my problem head-on. These people counted calories. They not only counted calories, but made adjustments based upon their body types, seasonal weight changes and activity levels. They understood food composition and timing. I learned about the ratio of protein to carbs to fat in different types of food, and how to adjust what types of food I ate during a specific time of the day. These people were constantly eating, every two to three hours to be precise. They adopted nutrition as a lifestyle. “Clean substitutes” were created to satisfy cravings from common foods. Rather than pancakes, try old-fashioned oatmeal with sugar-free maple syrup. A chocolate milkshake becomes a whey protein shake. A burrito is now a whole wheat wrap with grilled chicken, veggies and tabasco sauce. Eating healthy does not have to be boring. They thought about caloric density. Think about the relationship of how many calories are in a given volume of food. One pound of grilled chicken versus one pound of fried chicken is vastly different. Fruits and vegetables are your best friend. They operated under a concept of moving averages for daily caloric intake. For example, if you ate 2,000 calories one day, slipped up and ate 3,000 calories the next day, it would just be too difficult to eat 2,000 the next day, since your body has adjusted to this new normal. Therefore, crash dieting does not work! Over a few weeks, I absorbed as much knowledge as I could. I developed an eating plan that I could stick to, taking my lifestyle, taste and biological sensitivities into consideration. Teach a man to fish! I knew exactly what I was putting in my body and developed tools to track this. I read that to lose weight, I should take my body weight in pounds, multiply it by 10 and eat that many calories each day, meaning at 400 pounds, I could eat 4,000 clean calories a day and still lose weight. If you laid out 4,000 calories of grilled chicken, fruits, vegetables, whole grains and protein shakes, the pure volume of food would be shocking. I constantly ate throughout the day. I lost 20 or 30 pounds within a month. I weighed myself once a week to track progress and set a weekly target to achieve and kept at it. Once I got to around 360 pounds, I incorporated exercise and began walking briskly outdoors. Then, I began reading up on exercise routines and started with common movements such as bench presses; anything I could do with a 25-pound weight set. I had no muscle and a ton of body fat, making it difficult to do any sort of complex exercise. I just cranked through and built strength over time. 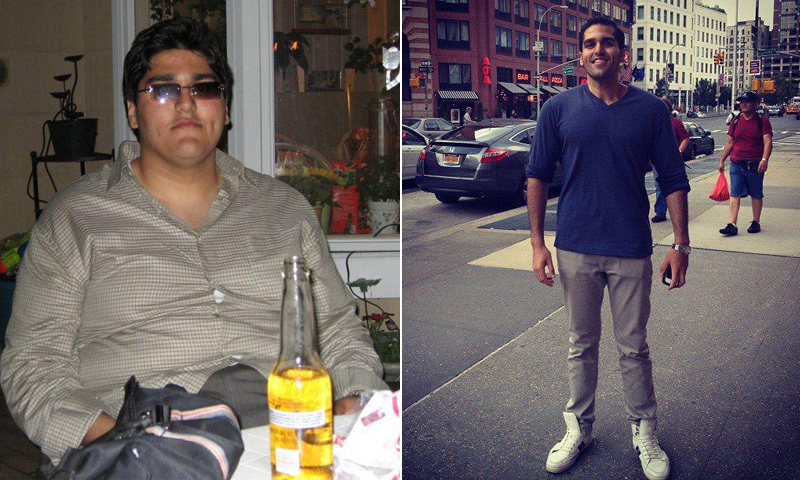 It took eight months to lose the first 100 pounds. I walked into my first gym at 300 pounds. I felt great about losing the first 100 pounds, but was extremely nervous -- I was in the presence of in-shape, good-looking people and felt intimidated. I kept to myself with my iPod and worked my way up to one hour on the elliptical. Sure enough, the pounds came off. I began doing more complicated weight lifting movements -- I just listened to my body and figured out when I was ready. It was a process of trial and error: read, try and reread. I kept at it for a year and a half and didn't stop. In just 18 months, I went from 400 pounds to 215 pounds. While my weight loss may seem impressive, it's the sense of accomplishment I have developed that is most rewarding. This has permeated all parts of my life. I'm a proud graduate of the University of Michigan and have had a successful career in business, having lived and worked in Dubai, Chicago and New York City. When people asked me if I was nervous about moving to a different part of the world, I knew I had the strength inside me to thrive in a foreign environment -- I'd just figure it out and roll with the punches. I'm finally living the life I was supposed to live. It just tastes that much sweeter that I did it on my own -- no surgeries, no fad diets, no trainers. My heart goes out those who are struggling with their weight. Now, I want to focus my efforts on them. Eventually, I would like to work towards a solution to the Indian diabetes epidemic. Indians believe in the concept of destiny, and as highly religious people, believe diabetes is something given to them through divine intervention. Shocking. I believe I have the track record, ability to communicate and will to help them. Don't listen to those who are unwilling to support you. When you really figure things out, it becomes less of a physical game and more of an emotional one. We eat because we are depressed, bored and tired. Despite what you may think, you are in control and can affect change. Get out there and make it happen.